Ask not for whom the bell tolls in Denver, King Soopers (aka Kroger), it tolls for you! 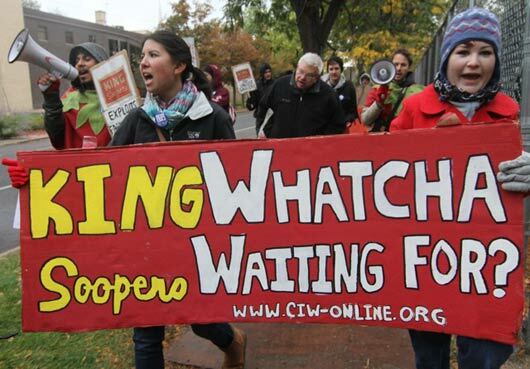 All is decidedly not quiet on the western front in the fight for food justice! Just days after last week’s big announcement that the CIW had reached a Fair Food agreement with Chipotle, the incredible crew at Denver Fair Food is back in the street, taking its message to local grocery giant King Soopers (one of two brands in the Rocky Mountain region owned by Kroger, the other being City Market). “(The Chipotle agreement) is a reminder that grassroots organizing between conscientious consumers and farmworkers has the power to shape our food system for the better. We… can take an active role in creating the world we want to see. If what’s past is indeed prologue, the time has come for King Soopers to stop stalling and join the Fair Food Program! There will undoubtedly be much more to come from Denver Fair Food, so we, for one, will be keeping an eye turned to the west in the weeks and months ahead. Food Sovereignty Prize tonight in NYC!